Our decorating ideas for the fox and arrow themed baby nursery you see in the pictures originated when I found out I was pregnant with my 3rd little boy. Since he was the third baby boy, I felt like I had already used up most of the color schemes out there and I knew the nursery needed a new design. 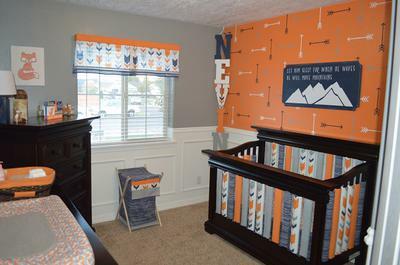 I love decorating with all shades of the color orange so I decided that my son's nursery would need to have orange included in the color scheme. Arrows and red foxes are both really popular right now and I thought that they would make a great addition to a modern nursery theme. The orange and grey paint that I chose was Behr brand from Home Depot. Go here to see many arrow and fox nursery items to use in your project. The orange and grey paint colors were both custom matched to the colors in the fabric. The name of the Behr navy blue paint was "Starless Night". The "Tribal Arrows Allover" stencil was ordered from Cutting Edge Stencils and used to stencil the arrows on the accent wall. With two little ones to manage, stenciling the pattern took us most of the day. The process involved stenciling then washing and then more stenciling and washing. This crib was originally my second son's crib. 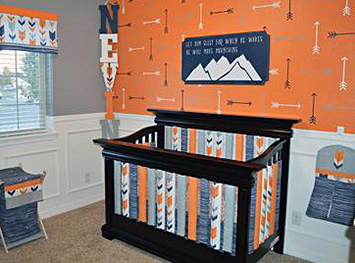 It is a Munire crib that was purchased locally from a home decor store, Eastern Idaho Home Interiors as was all of the nursery furniture collection featured in our baby boy's nursery pictures. 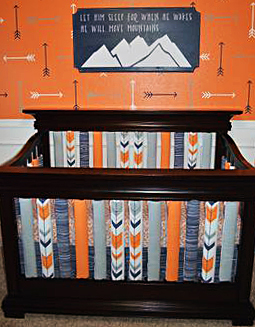 My baby boy's custom arrow and fox baby bedding set was all designed by my mother and I. My mother did a beautiful job in sewing the crib set and accessories using fabrics that I chose and special ordered from Spoonflower.com. The fox fabric used to sew the sheet and changing table cover were ordered from bobbieloufabric.com. My mother also made the nursery window valance and all of the other accessories such as the diaper stacker, the clothes hamper, crib sheets, the changing table pad cover, the bumper rails and the storage basket cover where I store all of my son's baby necessities on his dresser. The cover was designed with pockets and dividers for neatness and easy organization of items not stored away inside the dresser drawers and closet. 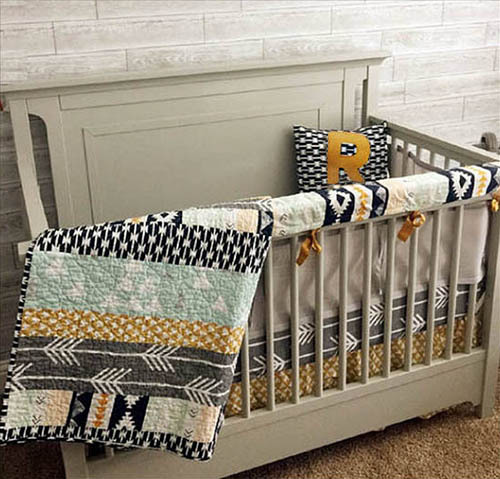 This baby bedding set features an arrow pattern with a touch of the southwest and an Aztec Indian atmosphere and can be found at SproutCribCoutureLLC. This nursery bedding would blend well with similar red fox nursery wall decorations, clocks and decor. I ordered the fox string art on the wall behind the dresser was purchased from an Etsy shop, as well as the block with all of my the baby's birth statistics on it and the red fox wall clock. A friend made all of the picture frames in the collage, we bought the lamp at Target and then painted it blue, and the fox figurines and wooden wall letters were purchased at Hobby Lobby. I painted all of the frames and the letters that spell my son's myself. Our baby boy's nursery was entirely my vision and my design. I loved planning every detail of the nursery and working so closely with my mother. The quality time spent with my husband bringing it all together was an added bonus. My husband did all of the painting, I did the touch-up painting when necessary and my mother did all of the sewing. A great fiend helped me with small details such as frame placement in the picture wall and such. Did "project nursery" take longer than you thought? This project wasn't hard to put together but, yes, it was time consuming and I could never, ever have managed everything by myself. The stenciled arrows on the accent wall took almost an entire day to do and it took my mom several weeks to perfectly sew each piece and accessory with the padded, double-backed bumper rails taking the longest to sew. What is your favorite feature in your baby's grey and orange fox themed nursery. I love how bright the nursery is, all of the tiny details and that we made it a family project. A lot time and energy went into planning and creating this space. I really just love everything about the entire room but as for what was my favorite part the process; it was probably seeing it completed with my baby boy inside the crib and I hope that other parents that visit Unique Baby Gear Ideas will enjoy the pictures and see something they can use in their baby's room. Beautiful design! I hope that you will not object to me copying your fox and arrow nursery theme. I plan to alter the colors a bit but otherwise the design will be very similar because yours is absolute perfection. Thank you so very much for the inspiration. Join in and write your own page! It's easy to do. How? Simply click here to return to BEAUTIFUL BABY NURSERY CONTEST.